As you’ll may be aware that I’m Gujarati and frequently prefer to have some of the special ‘Gujju Snacks’, this particular one happens to be pretty close to my heart – The Rava Corn Dhokla! It’s super easy, quick & yumyyyyy too! Well at least for moi! So I figured it would go well in my kiddo’s snack box too especially for those early mornings when you’re really crunched with time and need to figure out what to send for your child’s school snack box! I am guessing most mother’s would be dreading this morning dilemma as we’re always trying to figure out what’s best to give our kids for their school snack or lunch meals. While it is always more convenient to send a quick fix like ready fruits, dry fruits or a plain sandwich etc., I usually prefer to cook something fresh for my little one to eat at school. But if you may have read about my story of Tooting Tummy, you would know that my fussy monster is hard to please and refuses to try my dhokla! So I had to come up with something fun to make him try my Gujarati favourite! He recently brought home a Simpsons sticker from school as a reward from his teacher for writing well, and seemed very fascinated with it. That’s how I came up with my bright idea. I instantly decided on making it the following morning as I felt confident that my kiddo will surely give my favourite dhoklas a try! 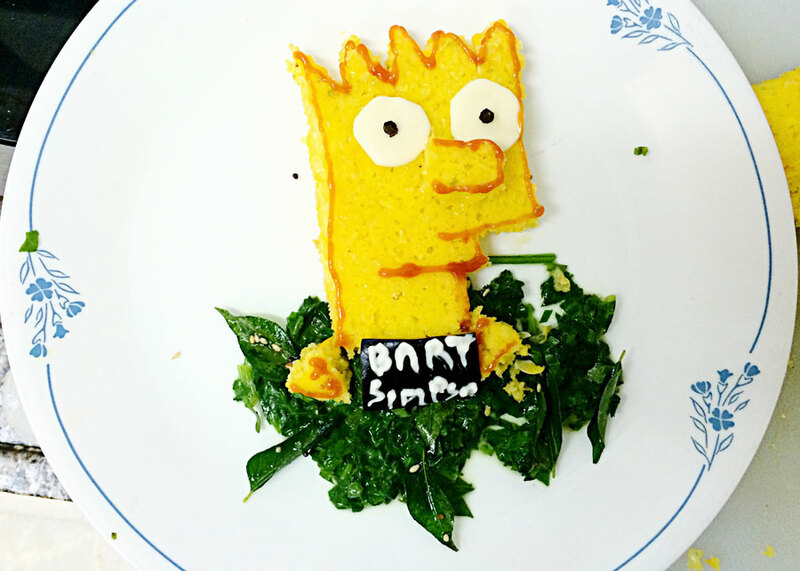 Here’s presenting my very own Bart Simpsons Dhokla! What’s really great is that everything on the plate is very healthy and edible. A really cute & fun snack for kids! Step 1 Cut the corn from the corncob. Step 2 Semi-crush them in a grinder. Step 3 Transfer it in a big bowl & add 1 cup each of the rava and curd in the corn, and mix well. Step 4 Add the salt, sugar, ginger & chilli paste and mix again. Step 5 Take a thali-style plate and grease it with the oil. Step 6 Add a pack of Eno and whisk it. Step 7 Pour this mix in the thali/plate and put it in a steamer for 10 mins. Step 9 Use a cheese slice and cut 2 small round pcs to make the eyes and shown in the image. Step 10 Put a little ketchup in a zip lock bag & cut one of the corner tips and paste it on the dhokla to make the border. Step 11 Now for the tadka, heat the oil and put some mustard seeds. Step 12 Once it starts to crack, add the heeng and curry leaves. Step 13 Decorate the tadka by putting it at the bottom of Bart Simpson as shown. Step 14 Use two mustard seeds to put on the eyes.